Finding enough office space can be a hassle. As our businesses evolve, we collect a lot of documents. We expand our businesses and hire more people. We amass more office equipment. We have seen a trend as of late where some offices are even using storage pods for their excess. Many use storage off premises. Many just keep piling things up in the office wherever they can find a place to put them. If you are looking for more office space, an industrial shed just might be the answer. Unlike a storage shed or a pod, the industrial shed can be built right on to your current office with full access. Or, you can even start fresh with an entirely new office for a lot less than it would cost to build a bricks and mortar office. 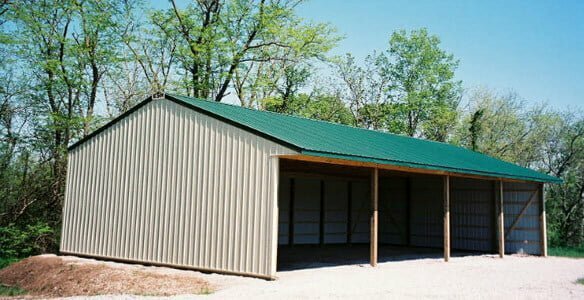 We have standard sheds or storage sheds that are already in kits, or we can design a custom shed according to your specifications. Our complete, free-standing industrial kits come in 50m x 20m x 10m or 61m x 51m x 12m, and have 10 ton capacity or more, gantry beams. We can erect the buildings for you, or you can erect your own shed. All of our sheds are ShedSafe certified, which means that they adhere to the strictest standards anywhere in the world. They provide the most space for your money of any other building strategy. They are great for office space, and lend themselves well to being customised on the inside to your own specifications. We are based in Perth, WA, but we will be happy to deliver and erect your shed anywhere in Australia. Many offices, factories, and even retail distribution centres are now using sheds instead of bricks and mortar for their buildings. Sheds cost less, they are easier to maintain, and they can be erected much more quickly than a bricks and mortar building. In August of last year, retail giant Woolworth’s spend $250 million for sheds to open the Hoxton Park Logistics Precinct in Sydney. The combined floor space of the sheds is estimated to be the same as 18 rugby fields. The facility houses 360 employees; 10,000 different products; and estimated that they would deliver 4 million t-shirts, 5 million books, and 400,000 bags of potting mix from August through December 2012.